Find your line in any weather. Down Thermagraphapping insulates your core while moisture wicking mesh provides airflow, making sure you're just as warm as you need to be no matter the weather. 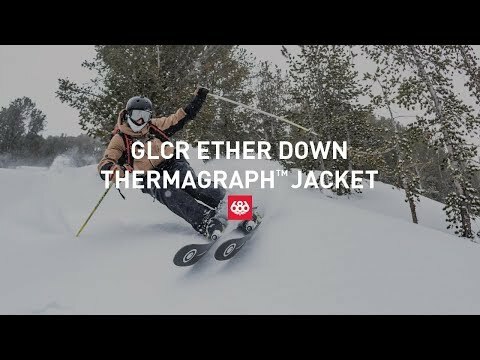 Thermagraph™ Body Mapping Insulation System using 600 Power Fill using 90/10 100% Responsible Duck Down - The ultimate natural insulation, Goose Down provides maximum warmth with minimum weight. The plumules of feathers creates loft and the fill power rating is a measurement of this loft. The higher the fill power, the less actual down insulation will be needed to maintain the temperature rating. 686 100% Responsibly Sourced Down ranges from 550 to 700 fill power. We ensure, through third party certifications, that all of our 100% Responsible Goose Down originates from humanely treated geese and does NOT come from animals who have been subjected to excessive harm like live-plucking. Waterproofing - infiDRY® 20,000mm - 686 exclusive infiDRY® watreproof and breathable fabric fuses our specifically engineered signature fabrics with a multiple levels of elemental protection to keep you dry, no matter how bad the conditions get. Every inch of infiDRY® fabric meets strict 686 specifications and endures countless hours of team testing to ensure the utmost waterproofing, breathability and durability. All infiDRY® fabric is able to sustain multiple washings with a specifically formulated outerwear detergent like Nikwax Tech Wash.
20,000mm/15,000gm - Our best waterproofing to withstand any conditions mother nature may throw at you.